Hotfix Available to Disable NRPT on Windows 8.x DirectAccess Clients | Richard M. Hicks Consulting, Inc. I installed this hotfix on my Windows8 machine and I don’t still don’t have any disconnect button. After installing this hotfix you will only see the disconnect button in a few scenarios – if you are on the corporate LAN, or if you are remote and haven’t established a DirectAccess connection, or if you are remote, have established a connection, and the option to allow users to use local name resolution is enabled in the DirectAccess configuration. In any of those scenarios you should see the disconnect button. How would you handle these scenario’s with Windows 7 clients? I can’t find a patch for them….. There is no similar update for Windows 7. Nothing you can do at this point, unfortunately. I have DA working on 2012r2 and a Win 8.1 client with this hotfix installed. When I connect to the corp lan and then stop the NLS site in IIS, the 8.1 client changes to “connecting” but I have no Disconnect button. The details below “Connecting” state “IPv6 is disabled. Contact your admin for help.” Any ideas? DA connects perfectly when not on the corp lan. It also works fine when on the corp lan and the NLS site is available. That’s unusual. When I tested this a while back it worked fine then, but I haven’t tried it recently. I’ll test again and see if I have the same issue that you do. I downloaded the patch and tried to install it on my Win8.1 x64 machine, but Windows says that this update is not applicable for my computer. Any ideas what I need to do? Perhaps it is already installed? Run the Get-Hotfix PowerShell command to confirm. Same for me. Hotfix says it isnt applicable to my computer. It isn’t in the list of Hotfixes already installed. If the patch is included in update rollup it should also bring the functionality to the Client, shouldn’t it? My computer is on current patch level and I don’t have the “Disconnect” button. I checked update history and the update rollup you are talking about is installed. Any ideas on that? I tested and confirmed that indeed it is there. 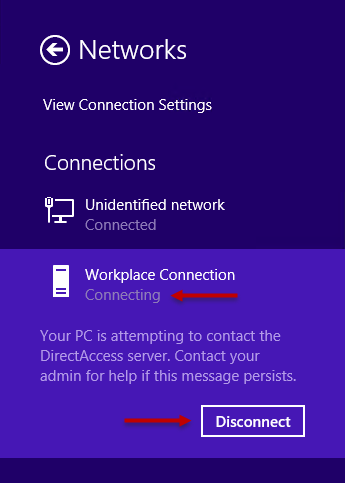 🙂 The disconnect button will only be visible while DirectAccess is in a “connecting” state. 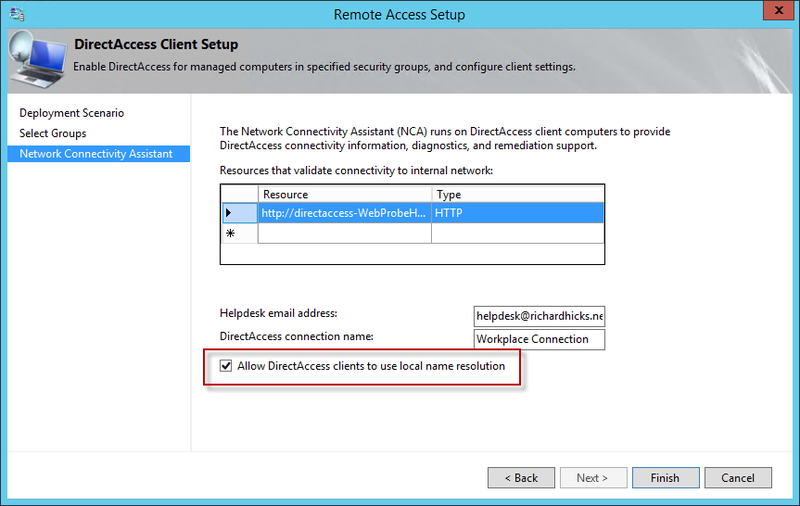 Also, it does require that you enable the “allow users to use local name resolution” option in the DirectAccess configuration.